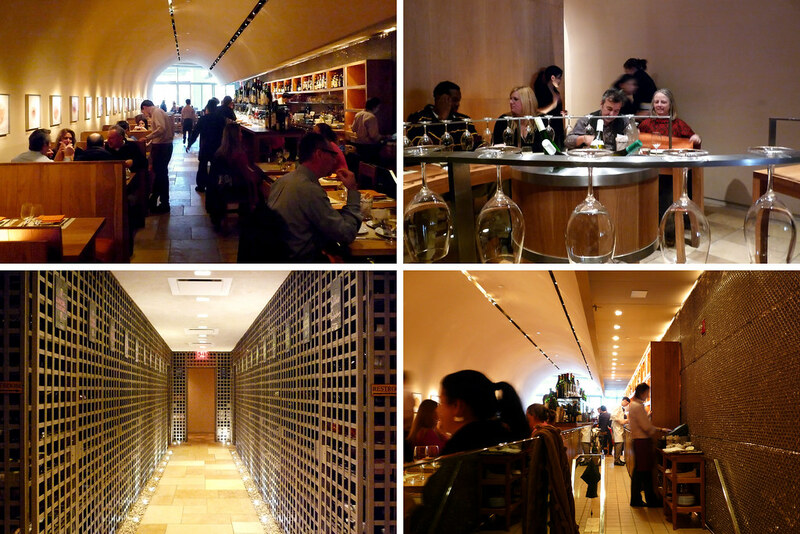 In this solo dining adventure, Gary makes his first visit to a restaurant in the Daniel Boulud empire – Bar Boulud. Top left – dining room. Top right – wine bar. Bottom left – wine cellar. Bottom right – prep station. When the list of restaurants participating in Restaurant Week Winter 2010 was released, I knew I wanted to do at least two places, one per week. Bar Boulud wasn’t necessarily at the top of my list but I had been itching to hit up a Daniel Boulud establishment for quite some time. When my friend JP came down in mid-January, we almost went here for a Saturday lunch but resolved instead to finally try our hand at getting into Minetta Tavern. Since we succeeded at getting into Minetta Tavern, there pretty much was no reason not to try Bar Boulud during Restaurant Week – if nothing else, it’d be nice to finally get it out of the way. Walking into the restaurant, I was struck by how narrow it was which, combined with the semi-circular ceiling and dim lighting, reminded me almost of a subway tube. Not to say that it’s a negative, just a funny first impression of the layout. As I was dining solo, they seated me at the wine bar in the back. From there, I had a good view of the other diners throughout the restaurant. It was an eclectic mix of older couples, businesspeople having a late lunch (I got there at 1:30 pm), as well as young parents with babies in tow. The latter would have seemed odd had it not been for the fact that this is the Upper West Side. 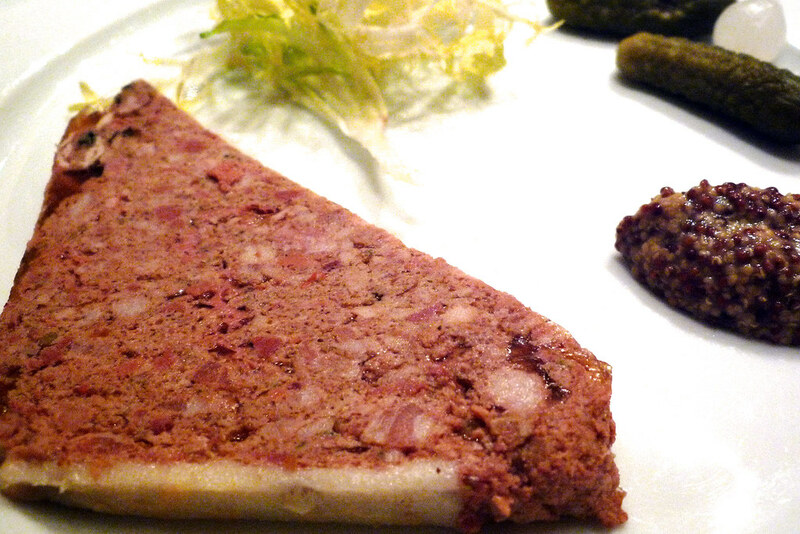 From the prix fixe menu, I chose for my first course the Paté Grand-Mère, consisting of chicken livers, pork, and cognac. It was served with cornichons, pickled onions, and grain mustard on the side with some toasted bread to spread the paté onto. It was sweet and fatty and it spread like butter on the toast. I went through the bread so quickly, I ended up slathering it onto the complimentary bread in lieu of the provided butter. Of course, to get the full effect of the paté, I ate it without the accompaniment of bread (okay, not so much for the reason I gave than to just stuff my face with delicious pork and chicken liver). This was a great start to the meal. The second course, the Gnocchi aux Crevette was a solid continuation of the meal. 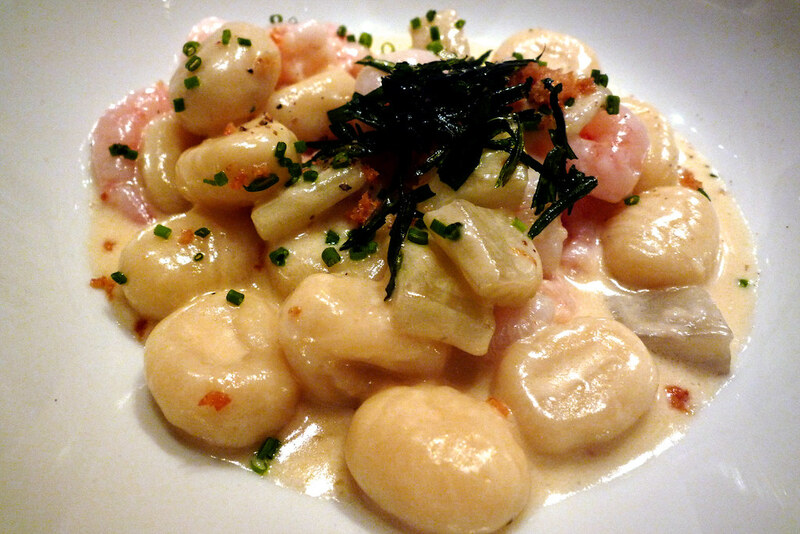 Light, impossibly fluffy potato gnocchi with baby shrimp perfectly cooked to just barely on the cooked side of raw and swimming in a tarragon cream sauce. For good measure, there’s also fried strips of tarragon on top. I could not stop eating the gnocchi despite my stomach telling me it was well in its happy place. I wanted to drink that sauce. Yeah, I enjoyed my entree immensely. 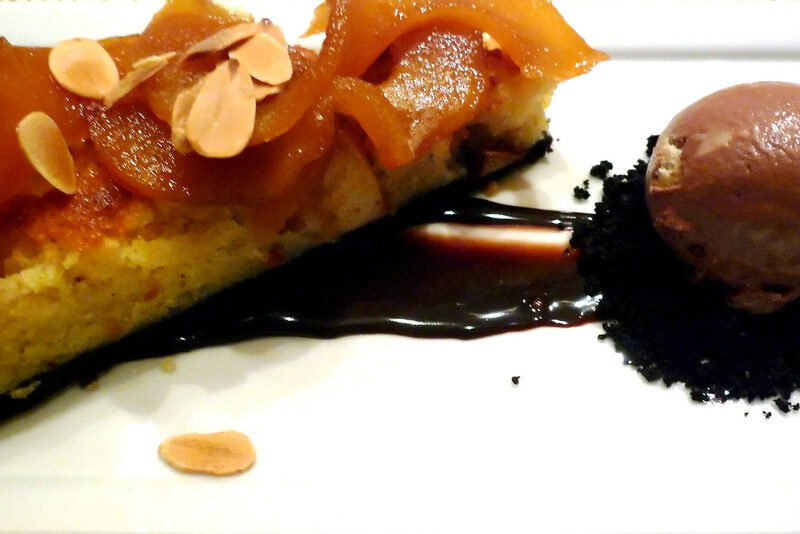 The only real disappointment was the dessert, the Tarte Poire Bordalou au Chocolat, an almond chocolate tart with thin pear slices on top and chocolate-vanilla ice cream on the side. The tart was really dry and lacked strong flavor that didn’t get any help from the pear slices on top. The ice cream on the side was nice but, really, it’s hard to go wrong with ice cream. I’m no stranger to Restaurant Week meals. I’m well aware that restaurants don’t always put out their best stuff which is fine, considering they’re attempting to extract as much profit out of a $24 lunch or $35 dinner. How they do it, however, is what entices people to come back to their restaurant when it’s not Restaurant Week. At Bar Boulud, it comes as close as possible to impressive even when you know they didn’t pull out all the stops (the dessert comes to mind). The paté is something they normally serve on their lunch menu for $10 but while the gnocchi wasn’t on the regular menu, likely as a lower cost option so they could break even, it was still immensely well done and tasty. More importantly, it left me wondering just how much better ordering from their regular menu could be. And, honestly, isn’t that what Restaurant Week is all about? Bar Boulud. 1900 Broadway, New York, NY 10023. [Show/Hide Map] (212) 595-0303.